If it were a 2 mana minion, that dealt 4 damage, this would have been good. But why would I include this weak minion in my deck? 2 spells just for 2 damage isn't really worth it. He kinda looks like the demon creature from Sinister! Creepy! Nothing special but man are blizzard pushing the burn shaman archetype. If it's good then this will see play and god help all of our poor faces when Shamans start flinging spells all willy nilly again! Are they even trying to make cards worth using anymore ? Should've been a priest card. It's a good card but WEIRDLY designed. When you can actually activate this (late game) 2 damage isn't particularly useful. It's great pre-turn 4 but you're unlikely to be able to activate it then. Might be good in some weird spell shaman deck that runs a lot of cheap spells, but I dunno what that would look like. Would have been so much better as a priest or mage card. Now, if only they would have introduced another card similar to Lava Shock or Eternal Sentinel... then I'd be inclined to call Overload Burn Shaman a viable option. As of now that seems unlikely though, unless you somehow get to summon Malygos with Eureka! consistently. And regular Aggro (Doomhammer) Shaman won't come back since Thunderhead ain't no Tunnel Trogg and Unbound Elemental is still too slow. Absolute trash in almost every situation. 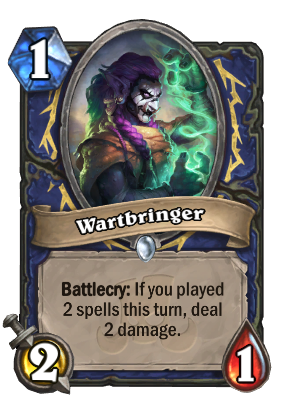 Best aggro shaman deck is Even Shaman and this can't be used in it, not that you'd ever be able to play it along with two even cost spells until its effect is already useless anyway. Btw if you think using unstable evolution to pop this off in the early game is gonna be worth more than playing unstable later when you can actually use Krag'wa or cast it more times, you're just wrong. It can get you the board back with Zap! and Lightning Bolt for just 2 mana in early and mid-game. Perhaps play the Spirit of the Frog to actually cycle the spells as well? I could see this being a rogue card, but shaman? Nah. It does not have enough synergies in standard, and not good enough for wild. I like this card, reason? It reminds me of my old favorite card that I often used it long ago, Undercity Valiant. I always used that card, now it's the chance to play this card with small body but medicore damage. Is it worth it though? Definitely not, but worth a try since Spirit of the Frog now gives lotsa card draw. It's dangerous to print big body card with aggressive text, like Cosmic Anomaly. "Use 3 resources (and probably overload yourself) to put a 2/1 in play and deal 2 damage."